Cone to pine nut yield (PY), an important commercial feature of stone pine cropping, was higher in Chile than in main producer countries. PY is highly variable along years and depends on pine nut number inside cones, followed by pine nut weight. Cone morphometry is not a good indicator of PY, thus selecting cones for size/weight will not improve it. Stone pine nuts are highly appreciated; however, pine nut yield (total pine nut weight as percentage of cone weight), important feature for the species cultivation, is variable and decreasing worldwide. Evaluating inter-annual and spatial variability of fruit traits impacting pine nut yield. Across years and plantation variability of fruit features were estimated from a multi-environment study monitored during 6 years in Chile. Variance component restricted maximum likelihood estimates were calculated for 14 fruit traits. Classification and Regression Tree (CART) was used to identify the variable best explaining pine nut yield. Pine nut yield (3.6–5%) was higher than in main producer countries. Cone weight (521 g), length and diameter were correlated to most of seed and pine nut traits, but not to pine nut yield. The most important fruit trait in determining pine nut yield was pine nut number per cone, followed by pine nut weight. 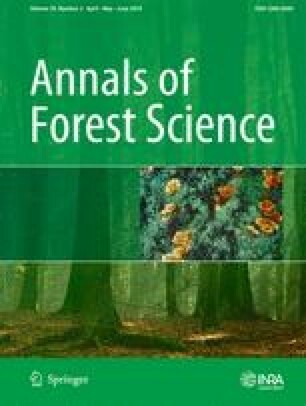 Pine nut yield showed high inter-annual and within plantation variability, whereas pine nut weight more spatial than temporal variability. Pine nut yield was superior in cones containing over 78 pine nuts. Pine nut yield has high inter-annual variability, with cone morphometry not being a good indicator, thus selecting cones for size/weight will not improve cone to pine nut yield. VL designed the study, directed the project that funded the study, and wrote most of the paper. MB designed, supervised, and performed the statistical analysis. CD was in charge of field activities and contributed to the paper elaboration. AA was in charge of morphometric measurements, elaborated figures, and collaborated in information gathering and practical issues of the publication. All authors discussed the results and implications and commented on the manuscript at all stages. We thank Aldo Salinas and Andrés Bello for the assistance with cone harvesting and to the plantation owners for allowing the access to the material. This work was supported by FONDEF, CONICYT, and Chilean Ministry of Education (grant code D11I1134).